The season everyone dreads is finally here. Back to school. The words are haunting. All the memories of the early mornings, full corridors and writing essays literally the last thing you wanna do after having 6 weeks of purely what you wanna do. I've found over the holidays I've had my bag, the exact same bag full off the same things every day on me. I'm such a hoarder in bags but I use everything I put in there. 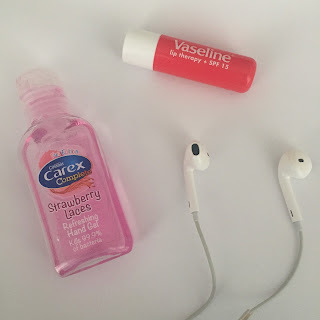 It made me thing what will I need in my school bag?? Packing my school bag means it's a reality & everything's gonna go back to how it was right before the summer. Which is dreading to even think about. But one thing I've learnt over the years Is what to bring to school. Bringing all the essentials but not making your bag heavy can be tricky so I've managed to narrow it down to just the small selection of things I need to make school less bearable & I can't wait to share them with you! Next is lip balm. Again probably unnecessary but my lips get extremely dry, especially now it's coming up to the colder weather so I always like to have one lip balm on me because nothing's worse than chapped lips and being able to do nothing about it all day, honestly the though of it pains me. Finally one thing I always have on me is headphones, like no matter where I go - even if I'm not using them I have to have my headphones on me. It's really strange I just feel like I need them on me at all time and I don't know why. But i usually they're for walking home from school because who doesn't love to listen to music?? I hope this might help someone or just entertain someone with the things I can't live without. Everyone has different things but these are just Afew of mine!